So why Kurdistan? As readers of previous posts may have gathered, I am here location scouting for my second novel, Astra. Without giving too much of the plot away, the book is set a century from now, after global warming has rendered much of the planet unfit for human habitation and the survivors of the catastrophe are slowly trying to reinvent civilisation. To reflect drastic changes to coastlines wrought by the floods of the Dark Time, and to signify the start of a new era, they have changed the names of all Earth’s continents and nations. When the book begins, the project of rebuilding is well underway, and Astra is a seven year old girl living in a new country called Is-Land, which has been settled by immigrants from all over the world. Is-Land’s location is purposefully ambiguous; its citizens’ relationship to their new home has echoes of the history of Israel, Iceland and Ireland, while Astra’s early adventures in the woods around her tap into my own childhood memories of climbing pine trees and roasting marshmallows around the fire in Canada’s National Parks. And because the novel is based on the Ancient Sumerian myths of the goddess Inanna, I also wanted to draw upon the landscape and history of Mesopotamia: the land of the Tigris–Euphrates river system, often called ‘the cradle of civilization’ and now encompassing Iraq, northeastern Syria, southeastern Turkey and southwestern Iran. Transposed over these borders is Kurdistan – a geo-political area heavily populated by a people who share a common language and national identity. But while the Kurds have gained semi-autonomy in northern Iraq, the other countries they inhabit still subject them to discrimination and repression, largely out of fear of what Kurdish national aspirations would do to their own borders. I began to read about Ancient Mesopotamia during my PhD, and of course the area is never far from the headlines, as the West rocks that cradle until it spills blood, and Syria butchers its own children. But it is not a region I have visited, and I am largely ignorant of its various cultures. So I began, as you do, with a quick Google – and the first thing I discovered was that the area between the Tigris and the Euphrates is known in Arabic as Al-Jazira – ‘the island’. That was the first sign. I instantly knew that I had to go to this ‘Is-Land’. 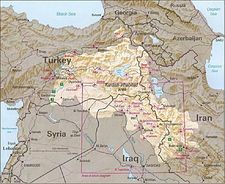 Iraq I deemed too dangerous, and in addition Astra is set in fertile land, not a desert; Iran is not between the rivers, and Syria was out of the question; so that meant I was going to southeastern Turkey. The map of Turkish train routes suggested that Diyarbakir was the city to aim for: the heart of Turkish Kurdistan. I drew up a circular itinerary, taking me to the towns of Mardin, Savur and Hasankeyf; the holy city of Urfa, said to be the birthplace of Abraham; and the village of Yuvacali, where I arranged a homestay. The internet remained my oracle, as the second sign came via facebook – my friend Sarah recommended a book of poetry called How Abraham Abandoned Me by the Kurdish writer Bejan Matur (Arc 2012). I will post soon about Matur’s depth-charged, fragmentary work , which is steeped in the painful history of her Kurdish identity. In mentioning her here, I do not mean to compare my journey to Anatolia to hers. My creative response to the places I am visiting for only a few days will hopefully pay homage to them, but can never speak from their very stones, as do the poems in How Abraham Abandoned Me. But the poet’s faith in her inner voice, not to mention her impulsive travel arrangements, were a shining mirror of my own. In the meantime, in Istanbul, I had had a third sign. I lost my ring – a square acid yellow plastic ring, with a daisy embedded inside. I couldn’t find it when I got back from the Hamam, and assumed it had fallen out of my bag near the lockers. I went back the next day, but it hadn’t been turned in. I was sad, because my friend Sung had given it to me in Korea, but as I trudged back to my hotel it occurred to me that I had no choice but to lose a ring on this journey. For the central myth I am working with in Astra is Inanna’s Descent to the Underworld, and before Inanna joins her sister Ereshkigal in that dread place she is stripped of all her jewellery. When I returned to my room there was the ring – on my bed, where it must have slipped from my bag and under a fold in the blanket. It strikes me now that it reappeared just as I was emerging from a period of the stress and anxiety that marks the lip of my own particular form of depression – for one reason I am interested in the myth of Inanna’s Descent is that it provides a way to form a working relationship with depression. But more on that anon. For now, more on daisies. One of the things I loved most about Istanbul was the city gardeners’ attitude to this humble little flower – far from ‘weeds’, they consider the flower a beautiful, billowing feature of their urban landscaping. As I really should have known, but learned from an article on camomile on the inflight magazine on the way to Diyarbakir, the word daisy comes from ‘day’s eye’ – so perhaps I have found a symbol of hope for my novel. The fourth sign, of course, that my journey was meant to be, was Diyarbakir’s uncanny echoes of my home town, Regina, Saskatchewan. I’ve now spent a day in the city, and will finish with one further point of resemblance: buttermilk. I grew up with cartons of this tangy ambroisa in the fridge, and love the stuff, but rarely encounter it elsewhere. 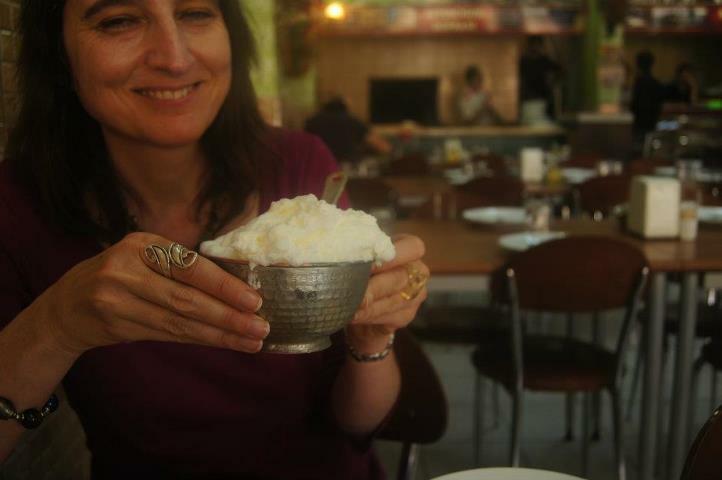 I did drink a nice glass in Istanbul, true – learning that in Turkish is it called aryan – but Diyarbakir raises the creation of buttermilk to an art form. I had a large traditional copper cupful today, frothed up as thick as whipped cream, and served with a copper ladle. Regina – catch up! This entry was posted in Kurdistan & Palestine 2012, Novels, Travels and tagged Al-Jazira, Arc Publications, Astra, Bejan Matur, buttermilk, daisies, Diyarbakir, Inanna, Istanbul, Kurdistan, Ruth Christie. Bookmark the permalink. Sounds like quite a trek you’re on Naomi- and fantastic that you’re going to do research for your novel. Ged Duncan gave me a heads up. But it really does an interesting project. I look forward to hearing more of how you get on. I’d be interested also in how you are doing your research eg notes in a book, thru poetry etc.My first book was set in Bologna, and I went late on in the project rather than before. Good luck with it all and enjoy the trip.